Large LED display: it displays time and temperature in big front for clear reading. Rotating Knob Design: press or rotate the knob to do all settings conveniently. °C / °F mode and 12H / 24H mode switchable. 3 Levels of Brightness Adjustable: rotate the knob clockwise to adjust with ease. Indoor Thermometer Function: temperature range: 0°C~50°C / 32°F~122°F. Night Mode: in this mode, LED display will automatically lower the luminance (default period: 18:00-06:00). Mirror Face Design: it also can be used as a small mirror. 2 Power Supply Modes: powered by USB cable(included) or 3 * AAA batteries(not included). When powered by 3*AAA batteries(not included), press MODE button, the LED display will light up for 5s. When plugged with USB cable, the LED display will be on always. Large LED display: it displays time and temperature in big front for clear reading. Rotating Knob Design: press or rotate the knob to do all settings conveniently. 3 Levels of Brightness Adjustable: rotate the knob clockwise to adjust with ease. With alarm and snooze function. 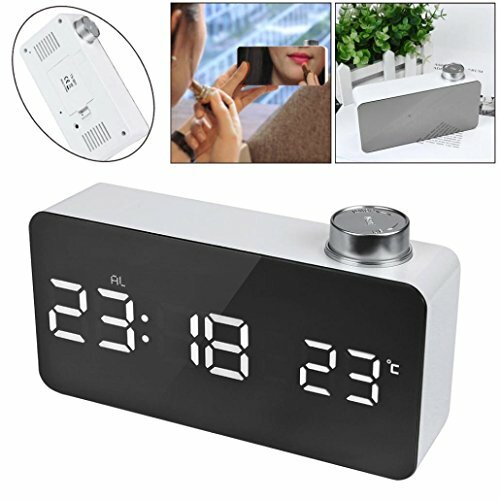 Indoor Thermometer Function: temperature range: 0°C~50°C / 32°F~122°F. Night Mode: in this mode, LED display will automatically lower the luminance (default period: 18:00-06:00). If you have any questions about this product by Ounice, contact us by completing and submitting the form below. If you are looking for a specif part number, please include it with your message.